When our air-freighted household goods arrived I had to go to the airport to pick them up, and take them through customs. They were just clothes and books and things, plus a used computer, on which I had to pay an import tax. To pay that tax and to clear my goods required me, and my handler from the school, to visit at least a dozen more or less adjoining offices, and sometimes to return to ones we’d visited before. At each one, papers were examined and stamped. And I thought to myself, “this is all so byzantine.” And then it hit me. I was standing in Thessalonika in the middle of the former Byzantine empire, what did I expect? The Roman empire, then the Byzantine, then the Ottoman (and Thessaloniki had been part of that empire from 1430 to 1912), they had bestowed the habits of two millennia of imperial administration on the present. Add to that a bloated modern public sector and what you get is a lot of stamping. At the Aliens Police, where we had to go to register, I saw red tape for the first time, I mean the actual crimson tape itself, used to tie up the file folders that lined the walls. The romance of Byzantium wore thin at times, but at other times it transported me through its art and culture, about which I had known so little before arriving in northern Greece. 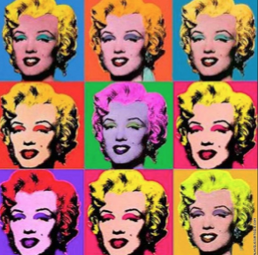 It’s odd, but the most prominent Byzantine presence in American culture is… Andy Warhol. The story starts, in fact, in Thessaloniki in the 9th century (or in Bethlehem or with St. Paul’s missionary journeys, if you prefer). In Thessaloniki were born the men whom we know as Cyril and Methodius, who became missionaires themselves and brought Christianity to the Slavs. They got as far as what is now Slovakia, where a community of Byzantine Catholics was formed. A millennium later, two members of that community emigrated with some of their compatriots to Pittsburgh in the US of A. 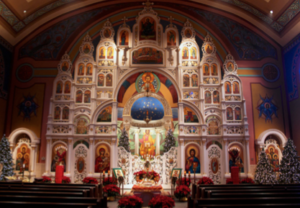 In 1928 they had the son who would be baptized Andrew in the church (still standing) that the immigrants had built and decorated in the Byzantine style. Andy Warhol’s artistic baptism also took place there. A sickly child, he also enjoyed reading movie magazines in bed during the week. 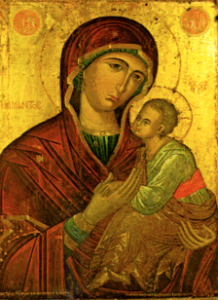 The combination of Byzantium and Hollywood produced our foremost American icon painter. Byzantium, which is the city that became Constantinopole in 330 AD and Istanbul in 1453, Byzantium also lives on for those Greeks, and Greek Americans, whose dream of restoring the empire has not died, even after the catastrophe (as is is known in Greece) of 1922, when Greece invaded what was about to become modern Turkey and lost badly. You can contribute to a fund to bring back the empire — but I don’t advise it. robert hoar on It’s out!